In May, Captain Samuel Thayer of the U.S. Army Corps of Engineers was sent to Norfolk to inspect the harbor defenses and make recommendations for their improvement. Thayer declared Fort Norfolk an "excellent position as it completely commands and enfilades the channel, and can prevent the enemy's fleet from acting in conjunction with his land forces in an attack upon the town." Mindful of Fort Norfolk's limitations, he cautioned that "the work was intended only as an enclosed water battery and not calculated to resist a regular siege." Nonetheless, Thayer found Fort Norfolk "susceptible of great improvements at a very trifling expense" (Corps of Engineers Reports [COER] 1812-1823:17). After visiting the Portsmouth side of the harbor, Thayer dispensed with professional courtesy in his criticism of Fort Nelson. "Badly designed and executed still worse," he called it. Fort Nelson, Thayer contended, "is of little military importance except as a water battery." Thayer thought the fort a defenseless giant and argued that enemy infantry could approach Portsmouth by land, seize the Navy Yard at Gosport, and threaten Norfolk "without much annoyance from Fort Nelson." Thayer pressed his point in terms designed to catch the attention of frugal bureaucrats. He could remedy "the prominent defects of Fort Norfolk" for less than $2,500, whereas rendering Fort Nelson serviceable would require "a very considerable expense" (COER 1812-1823:17-18). 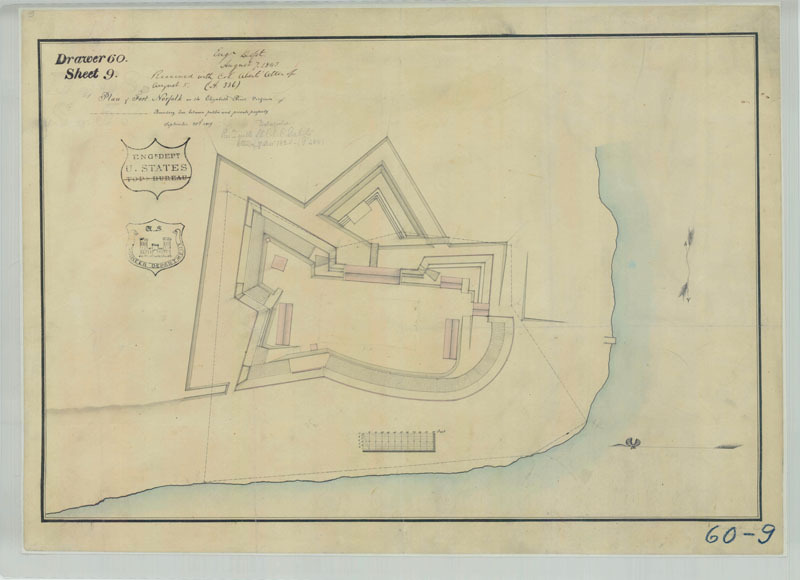 Captain Thayer proposed strengthening the rear or east "curtain" of Fort Norfolk, which then consisted of a "barrack-wall two & a half feet only in thickness." (A curtain is simply an unmodified section of a fortification extending between two bastions.) He recommended protecting the brick curtain "with an earthen Raveline" and installing an "Iron grate to the lower tier of windows." Willard B. Robinson defined a ravelin as "a work consisting of two faces with a salient angle closed at the gorge." Ravelins, such as the one constructed by Thayer at Fort Norfolk, were set off from the main portion of the work by ditches and were intended to protect otherwise weakly defended curtains (COER 1812-1823:18; Robinson 1977:198, 204). According to Thayer, the "most exposed and vulnerable part of the fort" was the parapet on the "north wing," which faced the mainland. This particular parapet was too narrow to "withstand a battery of a larger caliber than six pounders." He suggested widening it and capping it with a rampart capable of supporting artillery. Compounding the weakness of the fort's north side was the absence of flank protection for the northeast bastion. Thayer conceded that constructing an additional flank position would be "very expensive," and he settled on the expedient of widening the ditch opposite the northeast bastion and "planting therein a row of pallisades" (COER 1812-1823:16). Moving outside of the main defenses, Thayer was dismayed at the location of the fieldworks "at the peach orchard in advance of Fort Norfolk" and at Fort Barbour, an earthen fort built in 1813 to protect the approaches to the town. He found them both "badly flanked." Skeptical that these extensive outer works ever could be properly supported by flanking artillery or "completely manned by Infantry," he dismissed them as "of no use in the defense of the fort, and consequently of the town." He contended that the works would imbue Fort Norfolk's defenders with a dangerous "false security" that would "suppress the spirit of offensive enterprise" (COER 1812-1823:17-18). Thayer warned that if the outer works were "penetrated at any point, or turned upon either flank, the whole line must in all probability be abandoned." Once taken by an approaching enemy, the outer works would provide the invader with sufficient cover to erect batteries. The batteries could in turn serve as "a parallel from which to advance his trenches" and envelop the town with siege lines. Consequently, Thayer declared Fort Norfolk's advance works "worse than useless" as they were "favorable to the approach of an enemy" (COER 1812-1823:17-18). Thayer recommended substituting Fort Norfolk's outer works (and Fort Barbour in its entirety) with three strong redoubts situated at the heads of the two creeks that "peninsulated" the Borough of Norfolk and a third to form a salient. Along the "succession of narrow defiles and thick woods" between the three redoubts, Thayer would deploy a mobile force of "axe­ men, Virginia Riflemen, some light artillery, and a few Regulars." Then, Thayer concluded with confidence, a "force of 300 men would more effectually command and secure this pass than an army of 3,000" (COER 1812-1823:17-18). Samuel Thayer worked through the summer and early autumn of 1814 at Fort Norfolk. On November 1, he submitted a report to the Chief of Engineers, Brigadier General Joseph G. Swift. "Fort Norfolk has been improved," Thayer wrote, "nearly in the manner proposed in my report of 17 May 1814." The parapets had been widened; there were new ramparts and gun platforms. A glacis had been raised that extended outward from the ditch surrounding the fort. (The ditch separated the rampart and the glacis.) The glacis gradually sloped down and outward into the surrounding terrain on the north and east sides of the fort. As planned, Thayer had also protected the "feeble curtain in the rear" with "a large covering ravelin." Rather than bolster only the opposing side of the northeast bastion, Thayer had "the whole work surrounded by a row of Palisades" (COER 1812-1823: 24). While directing construction crews within Fort Norfolk, Thayer also supervised the somewhat simpler task outside the walls with perhaps a hint of grim satisfaction derived from showing up the militia. "The lines in advance of Fort Norfolk," he told his superior, "erected at such vast expense during the last year by order of General Taylor have, for reasons outlined in my report, been completely dismantled and demolished." The War Department had made no decision on Fort Nelson. If Thayer could not erect additional works at Fort Nelson, he suggested that the entire place be demolished and the large stockpile of "ordnance and military stores now deposited there be removed to some place of greater security" (COER1812-1823:24, 26). In March 1815, Chief Engineer Swift recommended Captain Samuel Thayer for a brevet promotion. In a letter to the Secretary of War, Swift extolled both Thayer's "valuable Services during the Northern Campaigns of 1812 & 1813" and his "Scientific defensible works of Norfolk during the past year" (BC #548, Swift to Secy. of War, March 30, 1815). In December 1814, British and American diplomats signed a treaty at Ghent in Belgium ending the War of 1812. Forts Norfolk and Nelson continued to be manned by Regular Army troops until 1824. However, the future of the two forts had been settled years earlier. In April 1818, Chief Engineer Swift told the Secretary of War that "the maintenance of Forts Norfolk & Nelson form no part of the project of defense proposed for Hampton roads & Norfolk." Swift advised that "no further expenses should be bestowed on either of their works" (BC #773, Swift to Secy. of War, April 24, 1818). The authors of the 1819 "Commissioners report on the Chesapeake and the remaining part of the Coast" recommended only three fortification sites for Hampton Roads: Old Point Comfort (Fort Monroe), Rip Rap Shoal (Fort Wool), and the Craney Island flats (COER 1812-1823:361, 378).